Upgrading your existing sign to include a beautiful full color, dynamic LED sign that speaks to your community, will put you into the driver’s seat of reaching your potential client and speaking to them directly by a 15%-160% increase. Your new LED display from SignGig will act as a ‘salesperson that is working for you 24 hours a day, 7 days a week’. This will help you be in control of saving money, direct marketing all the while increasing your profits. An LED sign is the best marketing investment a business can make, hands down. You have the availability to specifically target your potential clients depending on the season, events and even specific time of day direct advertising. 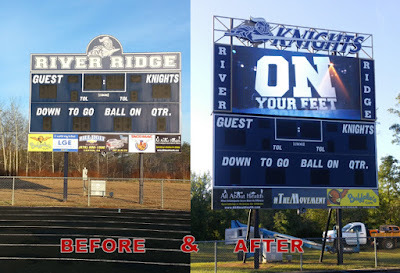 At SignGig, we work to help you retrofit and upgrade your existing sign to include an LED sign. Check out some of our before and after sign installations and ask us for referrals to best see how an LED sign can benefit your company, school & church! Whether you are a retail business looking to increase traffic to your store, a school wanting to speak directly to the campus and community or a theatre listing show times in a beautiful, simplistic marketing campaign, an LED sign can work for you! Have questions? Give us a call, we'd love to speak with you about our beautiful signs!